Add #ChordsofStrength to your tweets! I wonder if anyone ever suggested an audio book of COS… I mean we gobble up evety chance to hear him communicate – whether by singing,talking,rambling or even gesticulating with his hands and arms? What better way to while a cozy evening or a fun-filled warm afternoon than to listen to him narrate his life?! Those pictures are so good. David just makes me smile. You think if I tell David that I have been a widow for more than 20 years or that my boss hates me or that my kids will soon leave our nest, etc.. that I will have a chance of getting a hug, too? @Muldur twitted: “My friend just told me the guy who works in the store said he sold 1500 books today. Darn… lots of catching up to do but I have to concentrate on a report so CYL guys! Oh my looooord! I don’t even care that the book didn’t arrive here in time for my birthday -- this is the perfect gift for me. Waking up to new videos and pictures of David looking drop-dead GORGEOUS. Seriously. I almost cried while watching the first video. JR -- Thanks for more vids!!! Am done with all my unscheduled deadlines -- I can go back to dipity and do the work I LOVE to do! What’s up with google and gmail? Itsays they are verifying my account so I can’t open my mails and cannot upload to youtube? whyyyyyyyyyyyyyyyy? I have all his new COS interviews! I just finished listening to the entire 43-minute-22-second interview on AOL’s “Something Pitchy.” I found it very worthwhile and highly recommend it. OLEM -- i know its a bummer. Got suspended over the Shelley interview. The previous reason/s was the Kabuto vids by Wanda. Too bad, I have almost 200 vids. They are excellent quality vids and some are hard to find or almost impossible to download. Don’t care much for the hits. Just want other archies to have access to the vids. Either I create another account or just upload them all in mediafire as I used to do. Or better yet, just turn them over to the TDC Channel. What say you, Marlie? Oooh, baby, yes! Let me email you and teach you how to load them up here! No one can suspend you on this site, my friend. Here is an interview with David -- I wonder if it was one of the phone interviews he tweeted about. OMgoodness, one of the interviewers (a closet archie -- but now no more LOL)was wondering if David really wrote the book. Then she saw “ha-ha’ in the appendix and that convinced her that he did! MARLIE — that vid — ommyyyyyyyyyy… hear that growl! I am so excited to say that David has asked me to accompany him during his performance of “Works for Me” on Fox and Friends early tomorrow morning. This is a track that we co-wrote with Daniel Bedingfield and was the bonus track on David’s Record! So tune in and watch. I’m not sure if this is a national broadcast, but in New York it’s on FOX, Channel 5 and we will perform at around 8:00am!! FYI -- we successfully moved TDC from one hosting site to another today, so if you had a few moments of seeing a picture of Times Sqaure, well, that is why. This new move should improve performance and make the whole site load faster. Let us know if you see a difference! Finally! I thought my laptop was doing a number on me. Thanks Marlie for the speedy resolution. YA HEAR THAT? HE IS COMING TO MANILA SOON!!! What a great week -- we get to see new videos of David almost every day. Woo hoo! JR, thank you for keeping us all posted with all the updates! Oh, this is cool. David will do whatever is necessary to satisfy his fans. Table-top performance of CRUSH w/ a megaphone to boot! JR: Oh you little minx you! Thank you for all those videos. The “Maybe I’m amazed” one is just all kinds of not-able-to-form-coherent-sentences-salivating-on-keyboard-eyes-dried-from-not-blinking-for-the-whole-15-seconds-of-the-song awesome! I have more interviews EMBE -- got the latest with TCL, Showcase Minnesota & one more from the OntheRedCarpet.com — all uploading now to YT. And there are tons of fan videos from the book signing. CLUE: title given was in spanish, interesting eh? Was this already posted? David chit-chatting….and a little bit of sound check. jackryan4da- You are such a tease. I am dying over here. Has there ever been a pop album by an Idol in two languages? David is so thoughtful and I can imagine him wanting to offer his fans something like that. “Maybe I’m Amazed” -- oh em gee! At first, because he was singing while some guy was blocking him, I was wondering was that David? Did he pull a Rock Voice out of nowhere? Listen to how he hits the high notes in the second part. David rocks a little Paul McCartney himself, in how he can sing ballads and get all gravelly if he wants to. Marlie I agree -- I too am amazed! I don’t even know that song, but David nailed it. Had to actually check my pulse after hearing it. OT, but can ya’ll believe how bad I am; I was at my cousins graduation party today, and while I was happy for him, I kept thinking “gawd I wanna see if there are any updates about David” :/ I’m a horrible person. Um, David, have you been working out? Those pecs! JR: I was thinking the same thing about a Tour Page -- Book Tour! Let’s do it. JR #61, thanks for that reposting of Lean on Me. There are some BRILLIANT runs that David threw in there, I can see now why the girls went wild! David really is at home in classic R&B and other classic American styles and I hope he doesn’t stray too far from them. As for reviving your YT channel, I did the same. However, it sucked having videos that used to have 50,000 views now only run the low hundreds because they’re no longer high in YT searches anymore. 🙁 Good of you to see the silver lining though. There’s a marked difference in David’s demeanor in this book tour. More at ease around fans and interviewers — except when they formally start talk about COS, lol — he seems to be enjoying this phase. And don;t get me started with his get up. Clingy shirts? Skinny jeans? while standing on tables? JR #71 And don;t get me started with his get up. Clingy shirts? Skinny jeans? while standing on tables? Am also wondering about the FOX-centric promotion… did David sign-up with 19E as his new management? Hopefully by tomorrow the 5-part 43-minute SomethingPitchy vid & TCL vids have completed processing. I will create the individual pages for the respective book signing venues tomorrow. Have to get some shut eye now. There, all interviews, fan vids, pix and recaps in one place. A lovely, interesting article about the writing prosess. David Archuleta knows what you’re thinking. The smiling, sweet-natured singing sensation who swept through the seventh season of “American Idol” like a hurricane — only if hurricanes were adorable, sincere and charmingly awkward — asked himself the same questions after New York-based Penguin Group contacted him about the possibility of writing a memoir. 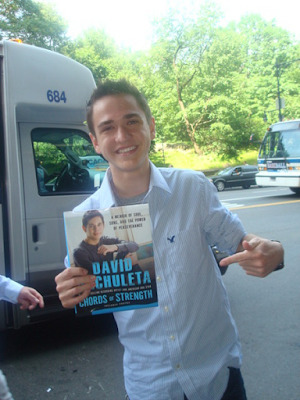 There’s an echo of that hesitancy on the first page of “Chords of Strength: A Memoir of Soul, Song and the Power of Perseverance,” which filled up sales racks on Tuesday and which Archuleta will personally be pitching to his home state fans with a pair of appearances this week at Deseret Book stores in Salt Lake City and Orem. The first line of the book reads, “I have no idea why I’m doing this, but I know I need to be doing it for some reason.” It’s possible, of course, that’s exactly how one of the best-known “American Idol” runners-up felt about sitting down to write his life’s story. The line is actually from Archuleta’s journal, however, jotted down during a break from “American Idol” auditions. It’s the last entry he made before fame happened. The abandoned journal is one reason why Archuleta, who grew up in Murray and still lives there, ultimately agreed to write a book. He’d told the nutshell version of his life and times to dozens, maybe even hundreds, of interviewers — why not write the story down himself, in his own words? And it’s not as though “American Idol” was the first thing that ever happened to him. By the time he began the book project, Archuleta said, he’d gotten used to talking about his stint on “Idol” and the singing career that followed. He knew what the questions would be, and he knew how to answer them. “I’d be like, step one, step two, step three,” he said. It would seem that Archuleta inspires such loyalty at least in part because he really is a sweetheart. Frederick Cristiano, who lives in Maryland and operates the fan site David Archuleta Web (www.david-archuleta.org), said he thinks that Utah’s favorite Idol is a genuinely nice guy. Cristiano said he recently read about Archuleta answering phones for a “Hope for Haiti” earthquake relief telethon: When the cameras stopped rolling, many of the celebrity phone minders immediately left, but Archuleta stayed behind to keep taking calls. And Cristiano, who at age 18 is six months younger than his hero, met Archuleta at a concert in early 2009. 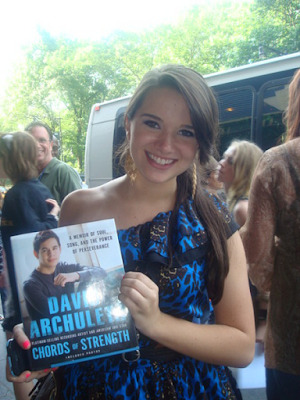 While many of Archuleta’s fans are teens and young adults, Garcia said that he doesn’t think what Archuleta has written will only appeal to young readers. ” ‘Chords of Strength’ is a book about facing your fears and emerging stronger than ever,” Garcia said. He thinks it’s a universal message that will attract interest from readers of all ages.